Kosovar refugees gather in Macedonia to receive emergency supplies. Photo courtesy of Catholic Relief Services/ David Snyder. Many of you have probably had the frustrating experience of being stuck in rush- hour traffic. Hundreds of thousands of vehicles clog every road, all trying to move in the same direction, getting in one another’s way, and becoming first impatient, then angry as the minutes tick by. Drivers feel caught up in events beyond their control, as it sometimes takes them hours to travel a few miles. Now, imagine that this flood of people has not been caused by a mundane event like the daily commute home from work, but by an outbreak of violence that has made people fear for their lives. In place of rush-hour exasperation, people are filled with panic and sheer terror as they cut each other off in an attempt to put distance between themselves and the horrible danger behind them. Although some people are cooperating and helping each other, most are so driven to escape that their sense of courtesy and decency has fallen by the wayside. If you were experiencing what many refugees experience, you would probably not be sitting in the comfort of your heated or air-conditioned car, but either walking, pushing a handcart filled with your belongings, or riding in a bumpy horse-drawn cart. You would watch enviously as the lucky few who did own cars passed you by. If you have ever experienced a sense of being trapped simply by sitting on a major roadway during rush hour, try to picture what your feelings might be as you and thousands of others inched your way forward with agonizing slowness, your small window of escape slipping by with each passing minute, and danger coming steadily closer. If you were not alone, but fleeing with your family, then you would also have to make sure that no one became lost in the crowd, and perhaps care for small children and ailing grandparents as well. 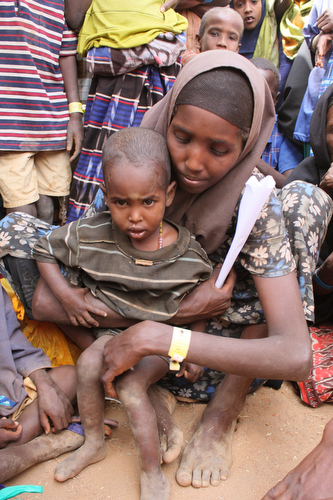 Somali refugees displaced by a severe drought gather at a camp in Dadaab, Kenya. Photo courtesy of Catholic Relief Services/ Laura Sheahen. Contemporary art, music and movies are filled with imagery of refugees, frequently attempting to convey just this—an experience of flight that seems inconceivable to many observers in peaceful countries, but which becomes all too real to more people each year. In popular culture, refugees are often viewed as exotic, poignant, and compelling, or as a cause-of-the-minute for many celebrities. Refugee children and families even serve as a source of convenient photo opportunities for public figures who wish to establish their humanitarian credentials. We find a more serious portrayal of the refugee experience in the 2004 film Hotel Rwanda, starring Don Cheadle and Sophie Okonedo, which tells the true story of an ordinary man who becomes caught up in the events of the Rwandan Genocide and eventually saves the lives of over a thousand refugees by sheltering them in the hotel he manages. The film captures an image of astonishing mass migration when a UN convoy, carrying refugees from the hotel to safety, suddenly finds the road clogged with a slowly-walking river of people. They are refugees fleeing from the front lines of the conflict between Tutsis and Hutus, and the UN vehicles slowly make their way upstream, honking their horns to clear the way. For miles, the refugees continue to stream past, before they finally thin out and the UN convoy passes through a brief firefight at the front lines as it crosses over into Tutsi-held territory and safety. Anyone who has seen the movie can readily identify the parallels between this scene and Vasily Grossman’s description of refugees during World War II. Although refugees and displaced persons undergo traumatizing experiences of fear, flight, and loss, in other ways they are just like us—indeed, most of them probably did not begin their lives expecting to one day be refugees. Many were probably, like us, previously more worried about everyday inconveniences like traffic jams than life-threatening emergencies. Hotel Rwanda conveys this lost normality as well, as we first see Paul Rusesabagina, Don Cheadle’s character, discussing the quality of cigars with a co-worker before he returns to his family in their comfortable suburban home with children’s toys strewn about the front lawn. Paul is, typically, concerned with making his wife and family happy and ensuring that his fancy hotel has the best supplies, before an abrupt change in Rwanda’s political situation shifts his focus to day-to-day survival. A happy end to the refugee’s journey, and an end to one's status as refugee, would also mean a return to these more minor dramas of life. When refugees have finally escaped from the danger threatening them and have found new homes, perhaps in another country, they can resume a simple matter of worry about when they will arrive home for dinner, rather than agonizing over whether they and their families will be murdered. In Hotel Rwanda, although Paul and his family suffer the loss of many loved ones, they eventually do escape through incredible luck, courage, and quick thinking, moving on to rebuild their lives in Belgium. Onlookers in more peaceful parts of the world often observe the refugees’ predicaments with detached pity, or offer them charity without really awakening their empathy for them. Welcoming refugees into your own community, however, would require a much more active sense of charity, and yet this is just what many Americans offered to Displaced Persons from Europe in the wake of World War II. With nowhere else to go, many Displaced Persons found homes and employment in communities throughout the nation, and eventually became American citizens themselves. The US Catholic bishops played a crucial role in educating the laity, encouraging them to welcome the refugees, and organizing the vast resettlement effort by matching particular refugee families to American community. Other American religious leaders did the same with believers within their own denominations. In this exhibit, we will see what the US Catholic bishops and laity did in response to just one of the refugee crises of the twentieth century. 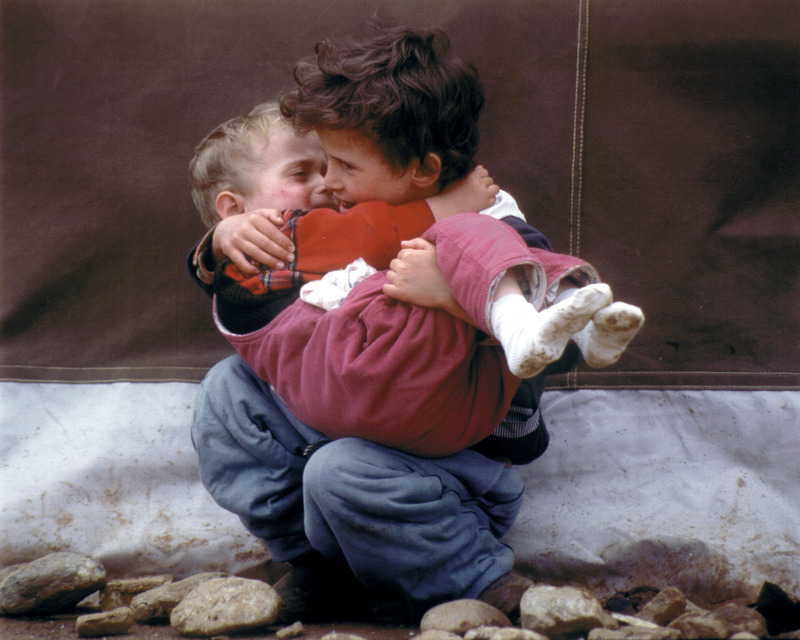 Children at a refugee camp in Kukes, Albania. Photo courtesy of Catholic Relief Services/ David Snyder. Some of the other crises of the twentieth century that have created refugees, and generally caused human suffering, include Israeli-Arab conflicts beginning in 1948, the Vietnam War in the 1960s and 70s, intercommunal violence between Greek and Turkish Cypriots in the 1970s, and more recent conflicts in Kosovo, Darfur, and Syria, to name just a few. The refugees created by these events are frequently, like Paul Rusesabagina and his family, or like Displaced Persons after World War II, dependent on the charity and intervention of outsiders for their survival. Charity extended to refugees, as we shall see, often serves two purposes: the first purpose is to provide food, medical care, and shelter to the refugees in their immediate situation, to keep them alive from day-to-day; the second, and perhaps more important purpose, is to provide them with a means of conveyance from their refugee situation to safe territory, and eventually to new homes. In Hotel Rwanda, the refugees’ survival depended on the UN successfully transporting them from their besieged hotel to a refugee camp at a safe distance from the fighting, and, in fact, the refugees manage to escape at the last possible moment. As conflicts between nations, interethnic, or interreligious violence unfold before us via our media, we also see artists, writers, musicians, and directors bring popularized, often sanitized versions of these events to the public eye. We associate refugees with feel-good benefit concerts, with celebrity fundraisers, and with Hollywood movies that strike a serious note in the midst of other romantic, comical, or dramatic offerings. 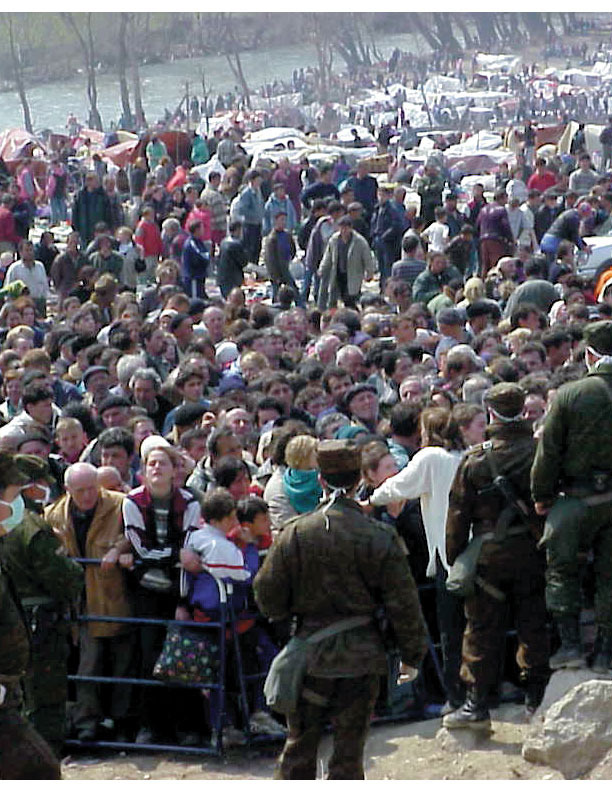 At the same time, the actual violence that takes place in these conflicts is often toned down for the viewing public. The massacres and atrocities of the Rwandan genocide are more often implied than shown in Hotel Rwanda, with the exception of a scene where Paul Rusesabagina mistakenly drives his van in the fog down a road strewn with bodies. The real Paul Rusesabagina, despite the personal recognition brought to him by the film, remained unassuming about his contributions. Even during the World War II era, popular films and media were bringing world events to the attention of the public in a sanitized form, educating them about refugees but simultaneously dulling their sense of horror. Kathryn Hulme, a United Nations Relief and Rehabilitation Administration worker, had a conversation with one displaced person in which she mentioned the indignation and anger she had felt while watching newsreels of Hitler’s armored divisions invading Poland. The Polish DP, a former army officer, shook his head and simply responded to her, “Kino,” or “movie,” implying that cinema could never adequately capture the experience of being there and seeing your friends shot before your eyes. Familiarity with the current events that produce refugees does not necessarily entail feeling empathy for them, or recognizing that they are ordinary people like us, only caught up in almost unimaginable situations of chaos and suffering. In the set of documents we will examine in this collection, we will see the US bishops repeatedly make efforts to recognize the individuality of World War II refugees, and to rouse the empathy and goodwill of the American Catholic laity. To counteract the tendency to see refugees as cookie-cutter archetypes for suffering humanity, the US bishops talked about everything from their resilient spirits and their passion for democracy, to their ornate ethnic embroidery and their innocent children. Their documents also anticipate the Catholic emphasis on the dignity and worth of the individual that we see in many of the pronouncements of Vatican II. American Catholic onlookers during World War II sought to emphasize that the refugees’ individual identities were not erased simply by becoming refugees. National Geographic News, “‘Hotel Rwanda’ Portrays Hero Who Fought Genocide”, http://news.nationalgeographic.com/news/2004/12/1209_041209_hotel_rwanda.html, accessed October 2, 2012. Kathryn Hulme, The Wild Place (Boston: Little, Brown and Company, 1953), 75. Quoted in William I. Hitchcock, The Bitter Road to Freedom: A New History of the Liberation of Europe (New York: The Free Press, 2008), 135.